Back in the day, figure skaters needed to worry about getting smacked on the knees with iron sticks (thank you, Tonya Harding for changing the face of the sport for years and years) but even without high-profile ice rivalries, skater’s feet are in constant danger. One of the biggest injuries ice skaters have to worry about it the danger of developing heel spurs. Let’s take a closer look at this kind of injury, and why skaters are so vulnerable to this problem. Heel spurs are a type of bone spur that forms at the base of your heel bone, and a bone spur is a bump that’s caused by abnormal bone growth. A heel spur can form when pressure or tension in the plantar fascia (connective tissue that runs from your heel to your foot) or in the Achilles tendons—causes an injury to occur beneath the surface of the bone, stimulating the buildup of calcium deposits and the growth of new bone in the direction of the tension. Heel spurs are often caused by plantar fasciitis, strained foot muscles or ligaments, or repeated tears in the membrane that protects your heel bone. 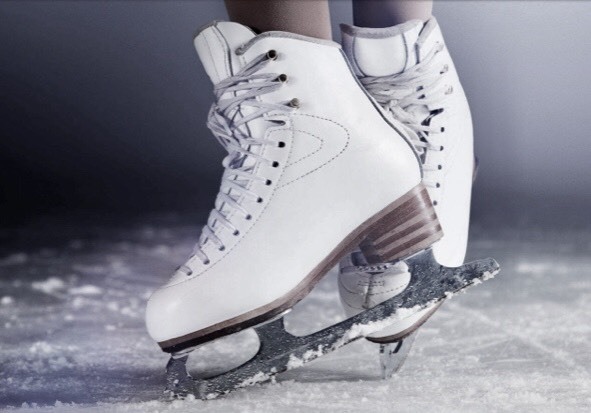 Figure skaters are particularly prone to heel spurs because they wear stiff boots and, every time they jump, spin or push off for greater speed, they put pressure and strain on their heels and tendons. Any skater wearing boots that aren’t fitted perfectly, or any athlete who fails to properly stretch before or after a skating is increasing his or her risk of developing a heel spur. On their own, heel spurs are typically symptomless. Because they often develop alongside plantar fasciitis, however, heel spurs can be associated with chronic, aching heel pain—which is often sharpest and at its worst when you first get out of bed in the morning. During the course of the day, that pain may dampen to a dull ache, but it becomes sharp again with prolonged standing or physical activity—like a training session on the ice! The good news about heel spurs is that they rarely require surgical intervention—there are so many less invasive treatment plans that can help manage this problem. Some of the most effect options include anti-inflammatory medications, physical therapy, orthotic inserts, cortisone injections and strapping or padding the affected area. Of course, as with many foot conditions, early intervention is crucial. As soon as you notice a bump forming on the base of your heel, come into the office so we can begin your treatment plan. With proper care and close attention, we should be able to avoid surgery, and any disruption in your training programs!